Hudson – Dominick “Jim” J. 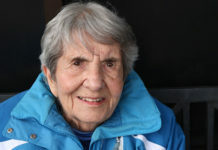 Arena, 89, of Hudson, formerly of Acton, and Walpole, passed away peacefully March 3, 2019 at Whittier Rehabilitation Hospital in Westborough after a period of declining health. He is reunited in heaven with his beloved wife of over 48 years, Yvonne R. (Barber) Arena, who predeceased him in 2016. Jim was born Nov. 18, 1929 in Norwood, the eldest of seven children of the late John J. and Mary A. (Dorigan) Arena. He was raised in Walpole, where he was a standout high school athlete in both football and basketball. After graduation, Jim honorably enlisted in the United States Marine Corps, and proudly served his Nation in the Korean War from 1948 until 1952, earning the rank of Staff Sargent. Jim went on to earn an associate degree from Dean Academy and began a distinguished and productive career in Law Enforcement. Jim began his career with the Massachusetts State Police in Walpole and later served as the Chief of Police in Essex, V., Edgartown and Lincoln, where he also served as the Fire Chief. 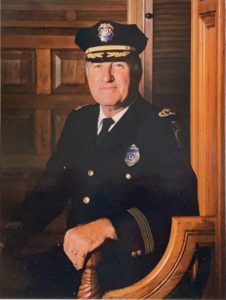 After retiring from the police department, Jim worked at the Worcester Federal Courthouse, where he retired as the Chief Security Officer at the age of 82. Jim was an imposing figure, who remained active his entire life. He was a longtime member of the American Legion Post 48 in Hudson. He also enjoyed woodworking, crossword puzzles and watching Judge Judy. Above all else, Jim loved spending time with his family. Jim is survived four children, Julie L. Locke and her husband Andrew of Hudson, Wendy G. Santini of Easton, Pa., Christine E. Arena of Burlington, Vt. and Deborah L. Coryer and her husband Gary of Colchester, Vt.; three siblings, Ellen Farrell, Ethel Fenstermacher and Joan Follett; his son-in-law, Robert Harding; 10 grandchildren; one great-grandchild; and many nieces and nephews. In addition to his beloved wife, Yvonne R. (Barber) Arena, he was also predeceased by his daughter, Karen A. Harding, and three siblings, Mary Kwiatkowski, John Arena and Frances Park. Relatives and friends are invited to a period of calling hours Saturday, March 9, from 10:30 a.m. until 12:30 p.m., at Tighe Hamilton Regional Funeral Home, 50 Central St., Hudson, immediately followed by a funeral service at 12:30 p.m. in the funeral home. Burial will be at Forestvale Cemetery of Hudson. In lieu of flowers, memorial donations can be made to the Parkinson Research Foundation, 5969 Cattleridge Blvd., Suite 100, Sarasota, FL 34232 (www.parkinsonhope.org).